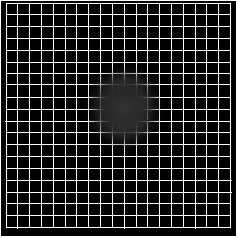 The Amsler Grid is a helpful tool for home monitoring of the central 10 degrees of the visual field. In particular, it is often used to detect problems with the macula, the area of the retina that is responsible for our sharp central vision. Some problems of the macula can be treated if they are caught early, for example wet or exudative age related macular degeneration (Wet AMD). Size Matters - when printing scale to 100% of the .pdf file size. The grid should be 10 cm x 10 cm in size. Instructions: Attach the chart to a flat surface (like a refrigerator). Viewing distance from the eye to the chart should be 12 inches (30 cm). If you normally wear glasses for reading they should be worn during the test. Test one eye at a time by covering one eye and then the other. 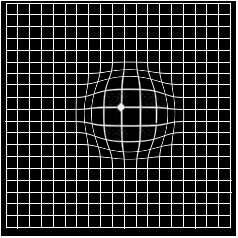 Always look at the center dot. It may not be clear, but look at the center of the chart. Can I see all four corners of the large square? Can I see all the small squares? Are any of the small squares or lines blurry, wavy or distorted in any way? If you notice any changes in the appearance of the chart from previous testing notify our office immediately! 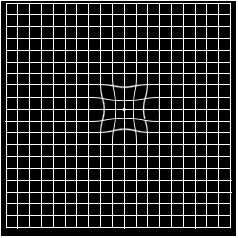 Central scotoma or blind spot - for example as may be present in a macular scar from advanced AMD. Arcuate scotoma - for example in a patient with advanced glaucoma. Macropsia - caused when photoreceptors are forced closer together. Micropsia - caused when photoreceptors are forced farther apart. Metamorphopsia- caused by a combination of squeezing and spreading of photoreceptors.